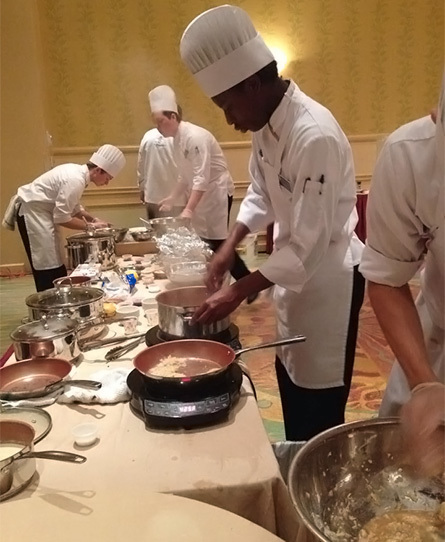 IFSEA reaches beyond common culinary and restaurant professions, assisting professionals working behind the scenes and those seeking management roles as well. We hold annual conferences, culinary competitions, and award ceremonies to network and discuss current happenings, but mostly to have fun. We also work on charitable programs such as certifications for homeless veterans. Our connections in the industry have helped countless individuals. IFSEA's professional development programs focus on boosting your professional credibility. For example, earning your food service executive certification will enhance your resume while showcasing your talents, knowledge, and experience in the field. Our certifications include both food service and process/application, with certification practice exams available as well. Richard is Vice-President for National Restaurant Consultants (NRC) in Golden, Colorado, has been a part of the foodservice and hospitality industry for six decades. NRC is a National and International Foodservice and Hospitality Industry consulting firm that specializes in opening restaurants, working with restaurant concepts that need adjustments through NRC’s registered “Operations Analysis” ® process, as well as a Richard is a sought-after industry professional “Expert Witness.” Richard has been involved in opening over 225 restaurant openings in his career as well as a renowned industry speaker. Prior to joining NRC, Richard served as the President and COO of Nick-N-Willy’s Franchise Company, LLC. Under his leadership, Nick-N-Willy’s—a small regional pizza chain—grew from 11 stores to more than 130 locations and successfully went public in 2009. Richard served as chairman of the board of the Colorado Restaurant Association from 2004-2005 and is the current Chairman of the Board of the International Food Service Executives Association (IFSEA) and also served in this capacity from 1996-1998. He also served on the board of directors of the Albuquerque Convention and Visitors Bureau, the Albuquerque Aquarium and the New Mexico and California State Restaurant Associations. Richard brings a unique perspective to food service and hospitality having been an owner-operator, restaurant kitchen design consultant, supply chain management expert, resource for addressing industry issues, and an expert witness validating both plaintiff and defense case positions. Ed is President of the Foodservice Institute which is a dba for E. H. Manley and Associates. Ed served at all levels within IFSEA and branch and national level, becoming Chairman of the Board in 1988. In 1989, Ed became President, managing the IFSEA HQ until 2006. He was brought back in 2007 and left again in 2008. A retired Navy Lt. Commander, Ed then was a hospital foodservice director for 8 years before managing IFSEA. In 20010 Ed set up certification testing through the Global Foodservice Initiative at SUNY Morrisville. Ed resides in Boynton Beach, FL. David Kinney, DODG, MCFE (food service industry) and CCE (the credit industry), has had forty years of financial management in the banking, financial consulting and hospitality industries. He has managed hotels and owned his own restaurant. He recently retired after 17 years with Intelliteach of St. Louis, MO. David worked as a financial consultant in cash flow management and as Regional Vice President. He was responsible for thirty law firm and accounting firm clients throughout the U.S. David has a BS Degree in Business Management from Monmouth College, Monmouth, Illinois. Additionally, he has received his Certified Credit Executives (CCE) certification from the National Association of Credit Managers and has served as a teacher for this organization. He also has served on the boards of directors for various charitable organizations. In retirement, David has remained very active in various volunteer responsibilities. These include IFSEA and is the new International Treasurer and he served as Past International Chairman in the mid-90s. He was a radio announcer on a small all-volunteer radio station plus he and wife Cindy worked and managed one of the largest venues at the International Balloon Fiesta in Albuquerque for 15 years. In March 2019, Dave and Cindy wanted less snow and more time with their grandkids and moved to Ocala, Florida.